Some traditions stick around through the years for a simple reason: they work. 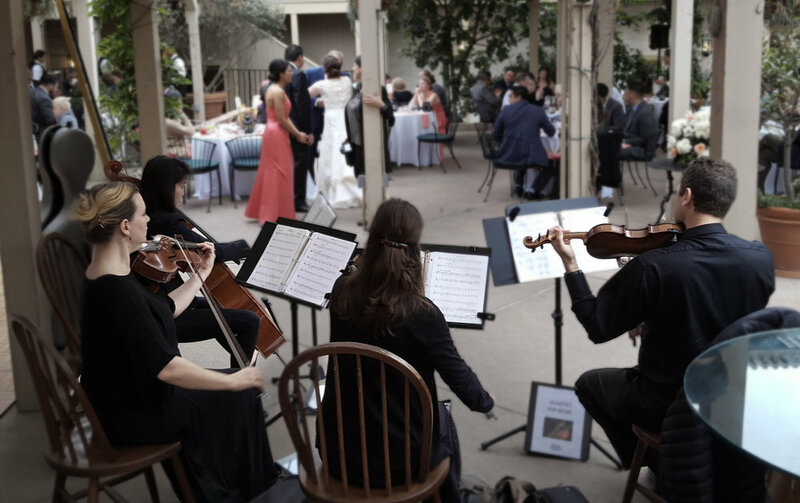 The classical string quartet-- made up of two violins, viola and cello-- has been a staple at weddings and other fancy affairs for centuries. It always sets just the right mood, adds an element of charm to the ordinary, turns the hoi paloi into the high class. In short, when you have a string quartet, everyone is pretty impressed. Our very own string quartet-- exclusive to G Sharp Entertainment-- Sol Sostenido Strings carries on that tradition with all the talent you'd expect and probably a few surprises you wouldn't. Quick, think of a piece of classical music. Got it? Well, Sol Sostenido Strings can play it. Pretty cool, huh? Canon in D, Air on the G String, Eine Kleine Nachtmusik (look it up-- you'll recognize it), or any other standard. Whether it's the Baroque of Bach and Handel, the Classical of Mozart and Beethoven, or the Romantic of Wagner and Brahms, they've got you covered. Sol Sostendio Strings is led by violinist and San Diego native Bryce Newall. When Bryce was just ten years old, someone gave him a tape of Vivaldi's Four Seasons and he's been hooked ever since. Since then he has trained with world-renowned instructors, learning first piano, then violin, viola and anything else he could get his hands on. Bryce loves playing and performing, of course, but he also has a passion for arranging. When someone asks him to arrange some classic rock piece that, very honestly, has no business being played by a string quartet, Bryce takes it as a personal challenge! As he told us, "Arranging pop music for string quartet is challenging, but there is such an enormous satisfaction in tackling it and then hearing your creation come to life." On a personal note, I can also say that Bryce has been nothing but a pleasure to work with since he joined the G Sharp Entertainment team. The consummate professional, Bryce is always prepared, always flexible to what the situation demands, and always as accommodating as he can reasonably be to the last-minute request. It's no accident that clients are impressed beyond expectations with our string quartet, and Bryce is a major reason for it. Please contact us for more information on Sol Sostenido Strings, their current availability, and to discuss what they can add to your event.